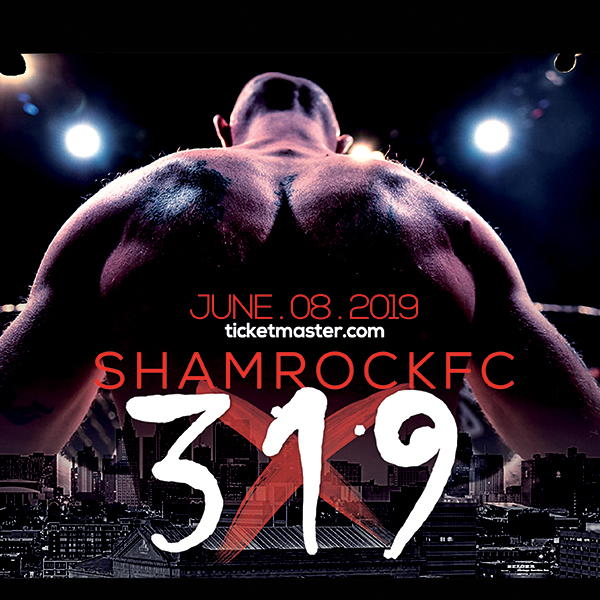 Shamrock Fighting Championships packed a punch on Saturday night with a nine-fight pro/am card that delivered. The main event for SFC: Demolition was a 165-pound catch-weight match-up between Finney's MMA's Rob Washington and Jeremy Castro. Washington stuffed two takedown attempts and from there turned it on full-blast. Washington's ground and pound, including some powerful hammerfists, started to chip away at Castro. From side control Washington landed crushing knees, as he continued to bring the thunder. Washington eventually got the mount before taking Castro's back. After the fight was reset, Castro was slow moving, holding his left shoulder, and winching in pain. After a brief check with the referee, Castro continued to fight but Washington knew the end was near. The veteran Washington got the fight back on the mat and continued with his combination of right knees to the body and right punches to the head until Castro verbally submitted. 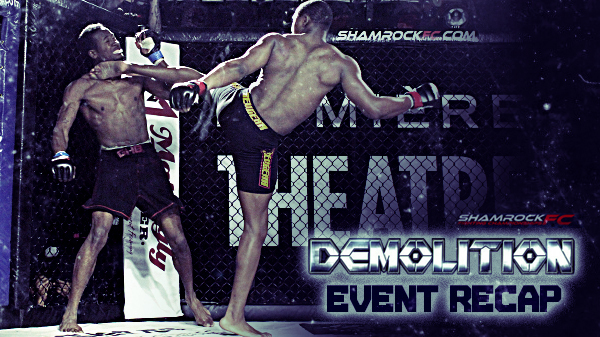 For interviews with Washington and other winners from Shamrock FC: Demolition, check back tomorrow. Scott Futrell made his long-awaited pro debut against a re-surging Joel Blair. The two long and rangy welterweights managed a harried first round. Futrell displayed excellent takedown defense in the early portion of the round. Off a scramble, Blair finally found the takedown he was looking for but it was short lived. Once the fight got back on its feet, it was Futrell who got the takedown and he began to bring the heat with punches and elbows. Futrell opened up a nice-sized cut over Blair's eye before the fight got back on its feet. Later in the round, Futrell took Blair's back, eventually transitioned into his guard and tried an arm-bar attempt that didn't take. Blair finished the round with another takedown. The frantic pace from the first round sucked the life out of the fighters in the second. Futrell connected on some nice punches while Blair seemed to be on constant hunt for the takedown. Blair did push the pace in the round and tried his best to be active. Futrell started the third round with a right hand that didn't hit flush but did enough to send Blair on the canvas. Futrell landed some nice strikes while on top and he continued to control the round. Blair did get a takedown late in the round. But in the end, it was Futrell who earned the 29-28, 30-27, 29-28 unanimous decision victory. Light heavyweight Tom Baker made his pro debut against three-fight vet Marc Goedeker. Baker leaned on his wrestling background to garner an early takedown. Once Baker was on top, Goedeker had nowhere to go. Baker slammed more than a few elbows and forearms and Goedeker was unable to answer the bell to start the first round. To jump-start the main card, Ben Chesser made his pro debut against fellow flyweight Malshon Ball. After a wild exchange to start the fight, Ball worked Chesser's neck, first from standing and then to the floor. After a scramble, Chesser locked in an inverted triangle and began to work the body with due diligence. Chesser brought down numerous punches and elbows to the body before Ball eventually slid free and took Chesser's back with one hook in. Ball took advantage of the position with multiple strikes and eventually flattened Chesser out and brought down more damage to end the first round. To start the second, Chesser pushed and pinned ball against the cage before eventually getting the takedown and gaining side control. But Ball suddenly sprang free and took Chesser's back , flattened him out and dropped several big blows. Ball eventually worked in a rear naked choke before Chesser turned the tides, taking Ball's back and pounding out the TKO victory. Portia Trust was a last-minute replacement and stepped up to fight Nikki Smith. Trust made it interesting early, making a valiant attempt at a guillotine. But Smith's obvious ground skills eventully showed as she grabbed the submission victory. A much-bigger-than-in-the-past Demagio Smith faced Daniel Jefferson at 165-pounds. With his back against the wall late in the third round, Smith (out of ATT Evoultion) landed a powerful head kick the resulted in Smith getting the rear naked choke for the submission victory in the final seconds of the fight. Finney's MMA's Kris Craig took the fight to Modern Combat System's Richard Jones, wining via rear naked choke in the first round. ATT Evolution's Kyle Datillo landed a strong kick to the head that triggered his first round TKO over Micah Livingston. Livingston came strong out of the box and was winning the fight before Datillo landed the devastating shot. Sebastian Grant and Staton O'Dell (in his MMA debut) started the night with a scrappy, entertaining, yet still one-sided fight that had Grant earning the ultimate decision victory.